Sixty-nine years ago today, a fictional Little Rock heroine took the stage of a Broadway megahit when South Pacific opened at the Majestic Theatre on April 7, 1949. It settled in for a run of 1925 performances. Like other Rodgers and Hammerstein musicals, this show tackled tough themes – this one being prejudice. That did not set well with some theatergoers. Indeed, some potential investors did not put money into the show because of its stance. But Rodgers, Hammerstein, Logan and Hayward persisted. Their diligence paid off when the musical received the 1950 Pulitzer Prize in Drama, only the second musical to receive this designation. It is also the only Pulitzer Prize for Drama winner to be based on Pulitzer Prize winning source material. This was the first Rodgers & Hammerstein musical to not feature big dance numbers. In fact, there was no choreographer. The dance steps which existed were created by Martin, who had taught dance in her native Texas as a young mother. Opening late in the season, South Pacific was named the 1949 New York Drama Critics Circle Best Musical, but was not part of the Tony Awards until 1950. 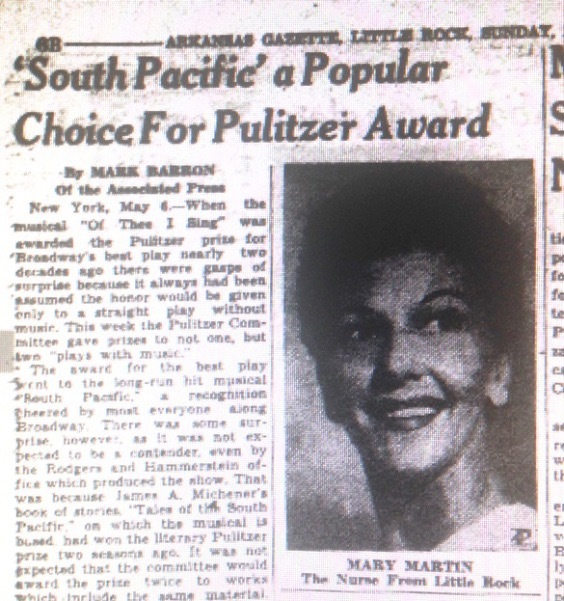 (Though Jo Mielziner, who designed the set for South Pacific received a Tony for his set designs of shows during the 1948-49 season and South Pacific was one of the titles listed.) At the 1950 Tonys, it received six Tony Awards (sometimes listed as eight because Book and Score were not broken separate from Best Musical that year—but some sources incorrectly separate them.) It was named Best Musical, Actor in a Musical (Pinza), Actress in a Musical (Martin), Featured Actor in a Musical (McCormick), Featured Actress in a Musical (Hall), and Director (Logan). This is the only time that all four acting awards in the musical category went to performers in the same production. In fact, the other two acting trophies that year were incorrectly engraved as being from South Pacific out of habit. In 1999 for the 50th anniversary and in 2008 for the opening of the first Broadway revival remaining cast members from the original production had reunions in New York City. At the 50th anniversary ceremony, a proclamation from Little Rock Mayor Jim Dailey was read declaring it South Pacific day in Little Rock and honoring the show. It is interesting to note that in 1949, there were two heroines on the Broadway stage from Little Rock: Nellie Forbush from South Pacificand Lorelei Lee from Gentlemen Prefer Blondes.